On the evening of February 12th, 2019, Acting Consul General Liu Jun was invited to attend and deliver a speech at a New Year banquet hosted by the China Chamber of Commerce-US (CCCU). 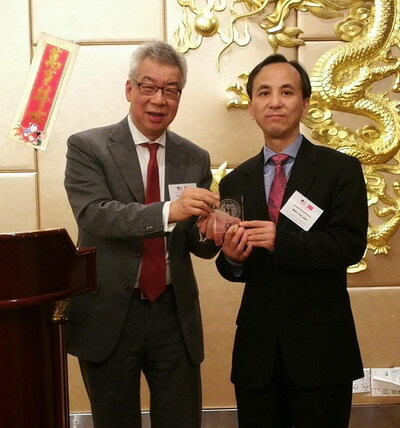 President Ren Jianhao of CCCU, along with nearly 100 people from various enterprises in the Chicagoland area attended the banquet. Acting Consul General Liu Jun gave a brief introduction of China-US relations and China's economic development, emphasizing that China and the US share the most important relationship in the world. 2019 marks the 40th anniversary of the establishment of diplomatic relations between our two nations. After 40 years of testing trials, I think it is safe to say that when our two nations cooperate, benefit abounds—however when we rub shoulders, no one wins in the end. The Consulate General is willing as ever to strengthen communication and exchanges with Midwestern businesses in order to promote the smooth and healthy development of bilateral trade and investment relations. In addition, Acting Consul General Liu Jun gave a presentation on the 2nd China International Import Expo and distributed relevant exhibition materials. The China Chamber of Commerce-US works to encourage China-US trade and investment activities and help both Chinese and American companies, professionals, and the public better understand the business environment and cultural traditions of the both countries.